The death of Lonesome George has robbed the world of not only a (sub)species (albeit one that has been functionally extinct for a long time since) but of one of the few celebrity reptiles. The short-sighted monkey creatures in charge of our planet have long equated “cold-blooded” with “evil”, and while amphibians have generally been rehabilitated into the cute/charming category — except in Australia — reptiles still get short shrift in the world of ecological marketing. For this reason, I’d like to take a break from my bird recital and talk for a minute about the truly marvelous reptiles I saw in Spain. Specifically, I encountered what I can only describe as a plethora of fascinating and engaging lizards. Since I encountered no lizards at all growing up, this did a lot to contribute to my vision of Spain as a magical fairyland. And I’m not even counting this guy. Now, I’m no herper. Most of the lizards I saw were identified to the extent of “Oh, there’s a lizard! Yup, magical fairyland.” I spotted a lot of small lizards emerging from cracks in walls, which makes me think that at least some of them were some sort of Wall Lizard. Others I suspect of being Spanish Psammodromus, scurrying about the edges of fields and rocky, shrubby areas. But the lead lizard of Spain, in my heart, was the Iberian Emerald Lizard. 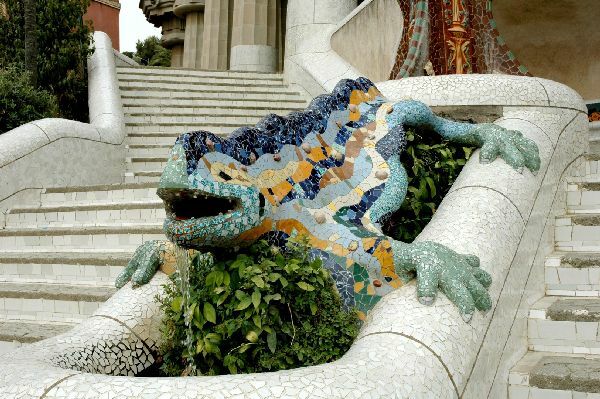 Closely related to the more prosaically-named (and more prosaically-colored) European Green Lizard, it looked a bit like Gaudi had gotten the design specs for his iguana passed through the hands of a dedicated bonsai artist. The blue head is vivid and distinct enough to look as though it may have come from a whole different species, or planet, than the grass-green body. Moreover, like any good creature of wonder and magic, it ran out into the path in front of me as I puffed down a cow path, stopped dead to give me a look, and then darted out of my life forever when I reached for my camera. I don’t know how the lizard felt, but the encounter warmed my blood. “Some sort of wall lizard” – indeed! Spain’s lizards are a combination of Empidonax (their identification, and remember lizards don’t vocalize) and Darwin finches (speciation, as every mountain slope seems to support its own species – and remember there are very, very many mountain slopes in Spain). I’ll send you a few links on Monday in case you feel like trying to find out some of the flashier lizards you saw. Spain is amazing, and your posts certainly do that aspect of the land justice. Very nice post again. Jochen, that would be great, thanks. I understand fully now why you are so enthusiastic about Spain! Carrie, here are the links. Regarding the Wall Lizards, you have likely seen Podarcis bocagei and/or a member of the Podarcis hispanicus complex, which might indeed be 6 species or more. In your area, you may expect Podarcis hispanicus morphotype 1A. The two are very difficult to separate though, and I have my doubts it can be done safely without catching them and analysing their shield configuration on the head. I am very glad you enjoyed Spain. By the way, Galicia (well, the entire NW of the country) is the only region within Spain that I have not visited yet. I really ought to!! Ha! I forgot to insert the link to wikipedia! Silly me.